In this paper, we are comparing various technologies for e-business trying to create a Virtual Mirror made up by a large digital screen like a computer monitor, a sensory device like a webcam. The system will work in the following way: When a person enters the field of view of the camera, the camera will start capturing the image of the person, and the algorithm of the system will start tracking the image of the person in order to recognize various body feature of that person. Each new person entering the camera’s field of view will trigger the computer to track the movements of the person. Thereafter, whenever the person selects an item from the shopping list, the item will be directly placed on that particular body part. This way, the person can try out different items and buy those items that suit him/her. Keywords: - Virtual Mirror (VR), Try It Online (TIO), Camera (CAM), Webcam Social Shopper (WSS), Virtual Mirror Application (VMA), Graphic User Interface (GUI), Fitting Box(FB). VR has attracted a lot of interest of people in last few years. One of the broad concepts in virtual reality is virtual mirror. Virtual Mirror is a computerized generated mirror that acts like a real mirror which allows a person to see himself/herself for various application. The application “Fashion Accessories Using Virtual Mirror” is a online shopping website which we will be implementing as our project. . Our project is restricted to face related fashion accessories like eyeglasses, earrings, caps/hats etc. Thus the system will be the visualization of fashion accessories for the face that a person can try and watch in front of a mirror although they do not exist in reality. This is achieved by using webcam of the user’s laptop. The user when enters the field of the view of the camera(CAM), there the camera captures the user. It starts detecting and tracking the movements of the user. When the user selects a particular item to try on, that particular item automatically pops onto that relevant body part and hence the user can try out various brands and decide whether that particular item suitshim/her or not by themexperience like manual shopping. When all the algorithms correctly implemented with real-time constraints, the customer will be able move freely and watch himself/herself with the new item that have been wore just few moments earlier. The system mainly consists of a single camera and a displayshowingthe output ofthe virtual mirror.The images ofvariousitemsare stored inthe database. Also the information of the users is stored in the database. Whenever the user buys an item, it is reflected in the column of the add/delete cart in the user info table and the final amount of the bought items is calculated and shown to the user. Mirrors have more and more applications as technology advances, and some of the most fascinating applications are those implemented by the advertising and computer industries. The Japanese auto-maker Nissan used large wall to ceiling sized mirrors to project full size presentations in front ofthe observer. The mirrors were interactive and the observer could push buttons just by holding up the hand without actually touching the button image. Adidas are known for their virtual mirror which allows the observer to view how different shoes would appear on the observers foot without he or her actually putting them on. In the Nanette Lepore department at Bloomingdale’s on Manhattan a prototype mirror doubling as a high-resolution digital screen allow customers to view themselves in mirror with different clothes on without actually trying them on. 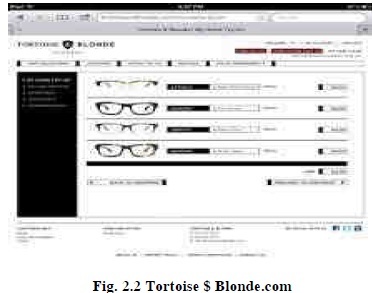 Tortoise & Blonde Eyewear, an online shopping website is the coupling of design, quality, precision, and customer service, with the creativity and vigor of today's tastemakers. Zugara was founded back in 2001 as an interactive marketing agency and they were fascinated with augmented reality. The first “problem” they tackled was the ecommerce shopping experience. They quickly began designing, developing and testing a prototype of their virtual dressing room, The Webcam Social Shopper (WSS). Their software is now available for the web, for events and for in-store retail. They also have a growing patent portfolio in the Augmented Reality Retail and Natural User Interface space. There’s now a cool application, Fashionista, created by Zugara that allows user to have a virtual dressing room via your laptop. The user can actually take a picture of his/her in this potential new attire and even get second opinions from his/her friends by uploading the images to Facebook. By using an AR marker to clearly mark the location for each garment location, the user can easily navigate the app with a simple flick of the wrist. The EZface Virtual Mirror Application (VMA) is a turnkey software solution that provides photorealistic simulation of makeup, hair color and eyewear products applied to the customer’s own photo. The EZface graphic engine is a combination of patented algorithms and a versatile and flexible graphic user interface (GUI). This engine produces unprecedented image quality incorporating true-to-life skin tone, facial features, and the color and physical properties of beauty products. 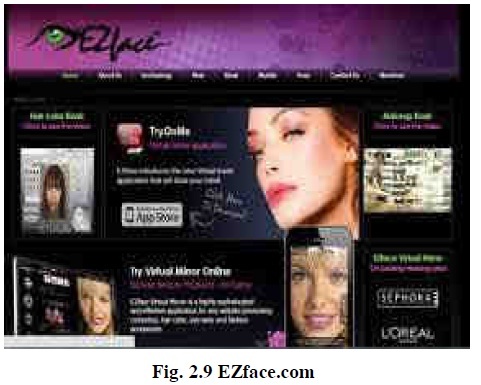 EZface Virtual Mirror is a highly sophisticated and effective application for any website promoting cosmetics, hair color, eye wear and fashion accessories. 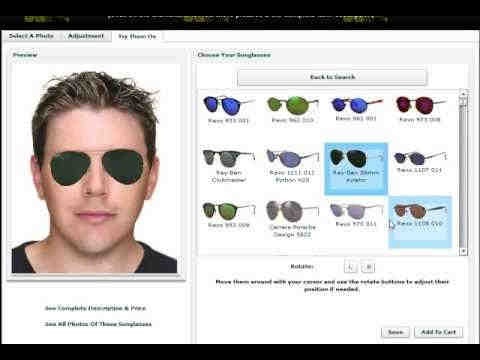 Users can try on any combination of products with realistic accuracy on their own photo. A host of innovative features allow for personalized product recommendations, direct links to any e-commerce platform and integration with the EZface Kiosk application for a focused individualized marketing strategy. The EZface web application has proven highly successful on the websites of leading cosmetics companies, including L’Oreal Paris, Maybelline NY, Garnier and Cover Girl.. Eyewear fitting and alignment to the user's face is completely automatic, without manual intervention in FrameFish website. Their software is trained using thousands of images of real people. It just works. In-built social sharing options allow users to share their virtual try-on photos with friends and followers on Facebook and Twitter, or download them and share them anywhere. TryLive for Eyewear is the only fully cross-platform solution available. The same media and application scenarios can be leveraged for use on the web, on mobile devices or on kiosks at the point of sale without rework. The mobile application works on smartphones and tablets running iOS and Android. TryLive for Eyewear offers three different 3D try on modes to offer the best experience to your consumers: Webcam-based try on : see glasses appear on user’s face and follow his/her head movements, in live! Photo-based try on: upload a photo or choose a model to try on eyeglasses. Video-based try on : record a video and see the glasses in replay. This is a must-have for people already wearing glasses! They can just remove their glasses to record a short video and then compare several pairs on several poses. TryLive also offers decision maker and measurement tool for a confident purchase: Comparison of 2 or 4 glasses simultaneously, like in a multiple virtual mirror, which is impossible in the real life. The user can take pictures and share it on Facebook with friends and family to get approval. Pupil distance measure for prescription glasses. Ray-Ban is using augmented reality to demo their products with the Ray-Ban Virtual Mirror. The technology behind the Virtual Mirror, called FIT3D Live, is made by a company called Fitting Box(FB), and according to them, they want to be “the driving force behind this digital revolution which will dramaticallychange the optical industry”. They’ve also found a wayto trackthe user face without the need for an augmented reality tracking marker, so existing reference points (eyes, nose, and ears) are apparently enough to place and move the sunglasses in real time. The end result is a rather fluid experience that accurately replicates the experience of trying on a pair of sunglasses, and it definitelyvalidates the idea that augmented reality could soon replace in-store visits as the way that they evaluate many products. • Quick preview and virtual try-on of new accessories. • Getting fashion advice and recommendations. • Shopping is made fun and social by shoppers capturing photos of themselves in different virtual environment with accessories and sharing with friends and family via photo sharing through social networks. • Increase sales and conversionrates byenabling shoppers to easily try on different new accessories online. • Increase store visits and walk-ins by providing fun and differentiated shopping experience. • Automatic accessories alignment and scaling. •Automatic body measurements and body shape identification. • Fast and easy virtual accessories try-on. • Photo-taking and sharing via social network. • In-store virtual accessories try-on system. • Increase new and repeat shopper visits by providing a fun and differentiated shopping experience. • Interactive digital signage and advertising solution. • Enhanced digital signage solution with augmented reality capabilities. • Our project is limited to face accessories like eyeglasses, hats, earrings, etc. In order to extend our application for complete body accessories, we need to incorporate gesture-based devices. • There can be security issues involving personal data manipulation. In this paper, we were comparing all the various technologies used by the various e-business companies like rayban and lenskart etc. and then coming to the result which one is making better use of the virtual mirror technology and is giving the customer better user interface and interactive environment for their shopping experience.in lenskart The Virtual Mirror is custommade for their subscribers to provide the most fulfilling and doubt free shopping experience and to give the services as fast and efficient as possible and the payment gateway is processed by the CCAvenue Gateway which is secure. Ray- Ban is the driving force behind this digital revolution which will dramatically change the optical industry that is the main difference between all the e-business companies and rayban the ideas with which they are working they have found an innovative way to track the users head movement without the use of argumentedrealitytrackingmarker whichhelps inmovingthe sunglasses in real-time and it actually replicates the idea of trying the pair of sunglasses in a store or on their site which is brownie point for them. A cool application, Fashionista is created by Zugara that allows user to have a virtual dressing room via their laptop. The user can actually take a picture of his/her in this potential new attire and even get second opinions from his/her friends by uploading the images to Facebook. By using an AR marker to clearly mark the location for each garment location, the user can easily navigate the app with a simple click. 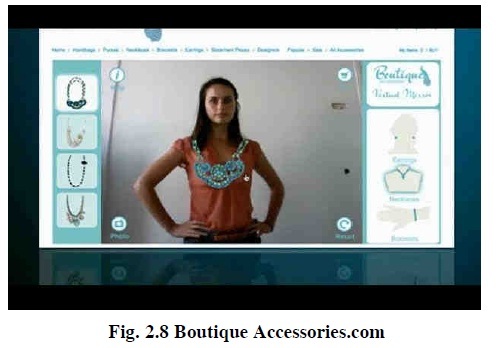 Boutique Accessories, a popular jewelry site, created this “virtual mirror, the user just has to visit its site and follow the instructions provided by the video the virtual mirror does not need customers to print out markers to hold in front of the webcam in order to activate the application. The virtual mirror automatically detects the user through the webcam image and, using key points on the face and neck, maps the jewellery onto the user in the correct position which was unique thing done by this site as it was not making the use of virtual mirror for tracking. The EZface Virtual Mirror Application(VMA) is a turnkey software solution that provides photorealistic simulation of makeup, hair color and eyewear products applied to the customer’s own photo . Users can try on any combination of products with realistic accuracy on their own photo. A host of innovative features allow for personalized product recommendations makes this site different from others as the uniqueness in this site lies in the method they are using argumented reality on the customers photograph rather than the original face ofthe user. Users can tryon anycombination of products with realistic accuracy on their own photo. TryLive for Eyewear is the only fully crossplatform solution available. TryLive for Eyewear offers three different 3D try on modes to offer the best experience to your consumers: Webcam-based try on : see glasses appear on user’s face and follow his/her head movements, in live! Photo-based try on : upload a photo or choose a model to try oneyeglasses. Video-based tryon : record a video and see the glasses in replay. This is a must-have for people already wearing glasses! They can just remove their glasses to record a short video and then compare several pairs on several poses these are the most provided options given by any site which makes this website customer friendly in providing wide range of options. At the end we can come up with two perspectives 1. users perspective 2. technology perspective. By comparing all the above applications, TryLive and EZFace satisfies both perspectives. M. Usman, K. Sporsheim, E. Bergstøl, I. Milanovic, R. Hercz, “The Virtual Mirror” , Human-Computer-Interface course, University of Oslo, pp. 6-7, 2007. 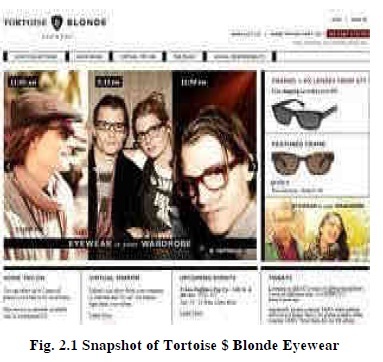 Tortoise and Blonde, ” The Tortoise and Blonde Experience”, http://tortoiseandblonde.com/about-us. SiliconIndia, “LensKart.com Launches A Virtual Mirror For Eye Gear”, http://www.siliconindia.com/shownews/LensKartcom_Launches_A_ Virtua l_Mirror_For_Eye_Gear-nid-100662-cid-100.html, 2011. Zugara, ”Our Story”, http://zugara.com/about-zugara/zugaras-story. 2008.